Three Words Describe u. . Wallpaper and background images in the Personality Test club tagged: personality test psychology physiological three words describe. Do u Suffer From Clinical Depression? Is this really works? Because I'm just scanning it from up to down.. It works. But yes, it takes time. Bail, us, the? How in the world does that describe me? kiss, kick, enigma -> everyday new me :D This is fun! ....um yeah, I guess I looked for the wrong words? kick, malice, pogo. is this something i should be concerned about? present,naked ,men and wtf with this. First word I saw...Man...I'm a girl. The other two, crush and fool. See, none and man. WOOW, it really sounds like me ._. 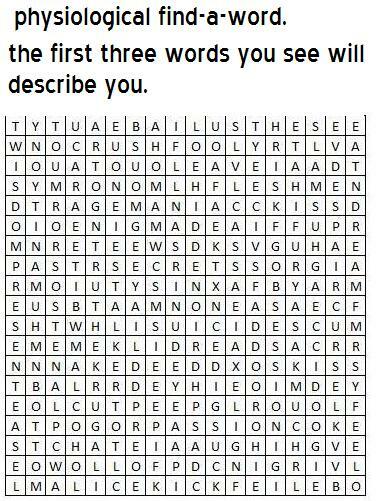 I find fool,crush and malice! Crush, car, and these. Huh? Reads, secrets and passion. Huh. I am angry!! PAST RAGE AND MALICE!! read, man, door... how does this work? The first two I can kind of understand but how does a door describe anyone? Suicide, maniac, and hate.... That makes no sense. Enigma, fool, and leave. This quiz must not like me. Leave, coke, and deed. Whaaaaaaaaaa? CUTE AND UGLY AND NAKED!?!?! 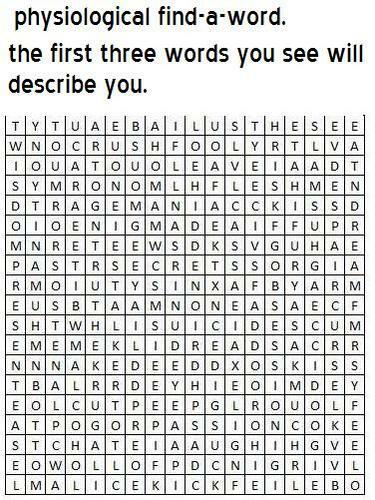 Dread, fool, and suicide O_O I'm a fool who's dreading the day where I kill myself? None of them make sense, espeacially man. Malice, hate, secret. This is rather accurate. Lice, sin, tea. What the hell? I don't even like tea! What Does Your Birth datum Mean For Your Love Life?